I made a dent in my wallet this weekend at the Theory outlet and the Coach outlet, but I got some items I really needed. I desperately needed a plain black suit for court and came across one at Theory that I liked. I purchased the Gabe B style in Broadway fabric in Black. This one is in Tailor fabric. I purchased the Golda skirt in Broadway in Black also. The one above is in Tailor fabric. Theory was having a 25% off sale, so on top of the already discounted prices I got another 25% off. Of course the suit was not "cheap" but I ended up purchasing it for less than 50% retail price, AND I only have to get the skirt taken in at the waist, which the sales associate told me would be very easy. I also made a stop at the Coach outlet. 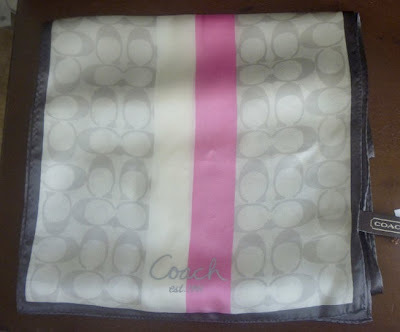 I never owned anything from Coach until this purchase. I don't want to come off as a snob, but when I buy something I don't want everyone and their brother to have it, which I feel is often the case with Coach items. Maybe it is because the items are slightly cheaper than other designer bags, or maybe people like the designs better, I don't know - but Coach is all over the place, and I never had a desire to buy it until now. I was lured into the store by a serious crowd of people and a 30% off everything coupon. When I went in I immediately saw two gorgeous silk scarves that I had to have. What made the deal even sweeter was they were both an additional 50% off their reduced price, plus the extra 30% off coupon. 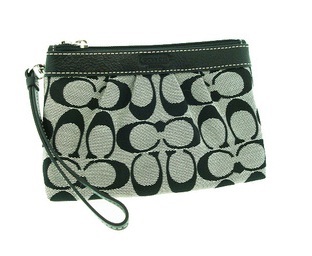 I purchased one in grey with a bright pink stripe, and one with the classic C design in black and white. I figure at less than $20 dollars each for a beautiful silk scarf you can't go wrong. This is a terrible picture from ebay that I found. I will take some of the ones I bought later. It will definitely fit right in with almost everything I own. Perfect for keeping my money in place in my purse, and great for a night on the town where I don't want to be tied down by a big bag. I may have found a new store to frequent! Everything I got was less than 40 bucks each, seems very durable, and is gorgeous! What do you think about Coach products?